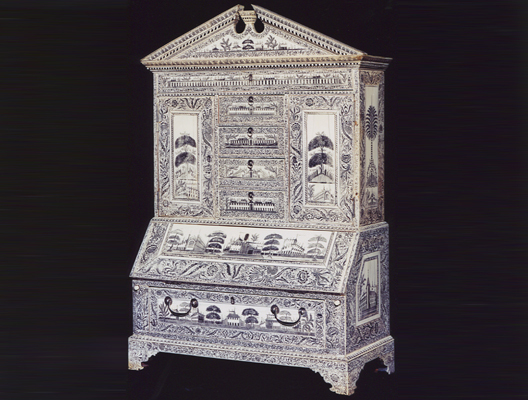 Executed in Sandalwood and veneered with ivory, engraved and highlighted with lac. Fittings of brass and silver. Minor losses and replacements, one bracket foot repaired. 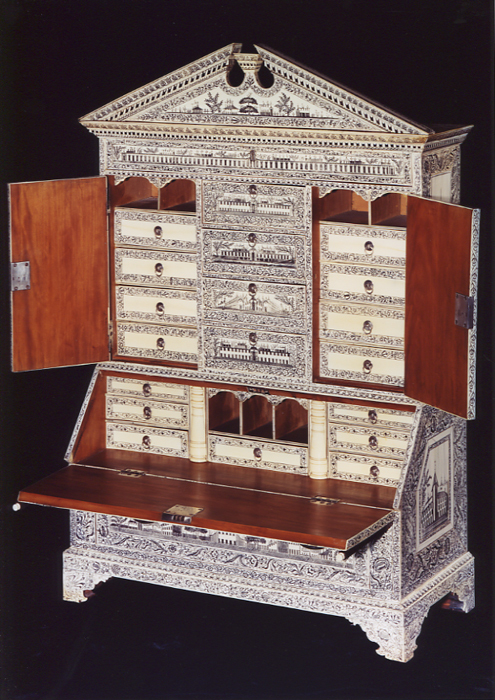 The bureau cabinet in two parts; the top configured with four vertically positioned drawers flanked by cupboards on either side. The lower section a bureau with one lateral drawer. 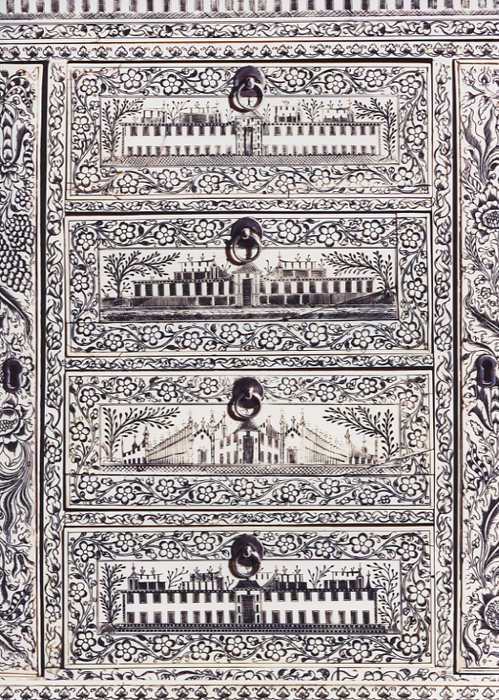 The interiors being fitted with various drawers, columns and silvered ‘penny backplate’ handles. The pediment being veneered and engraved . 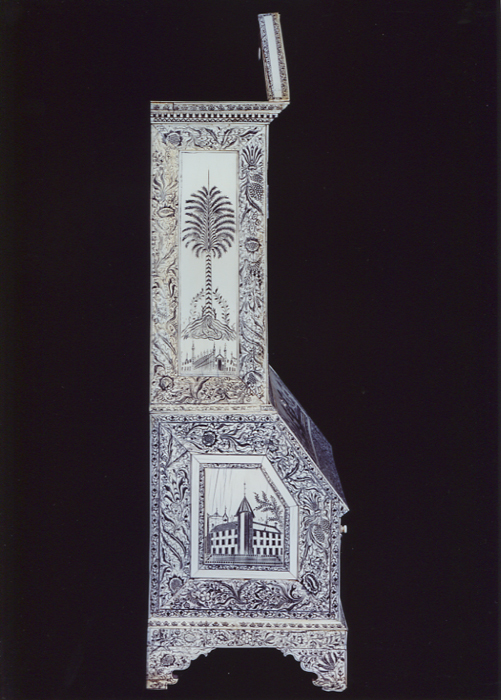 The engravings of the ivory veneers after European print sources and fantastic Chinese and Indian elements drawn from western-style architecture. 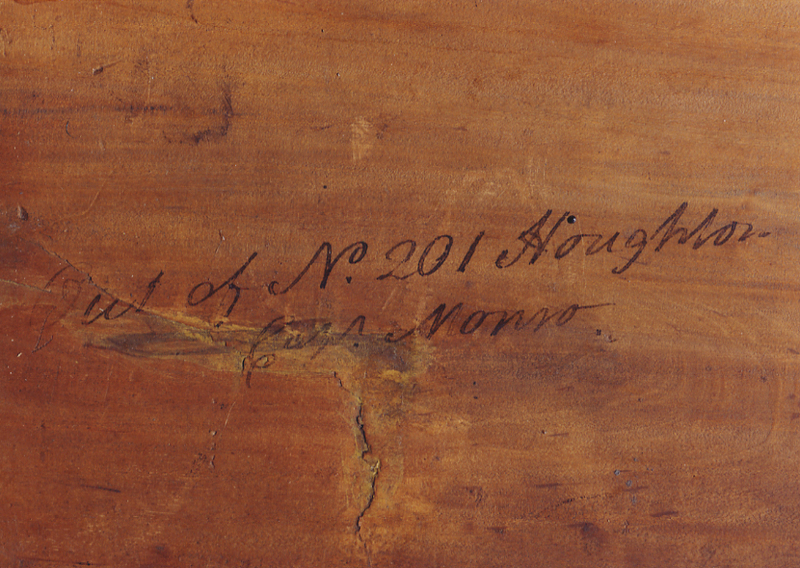 Captain James Monroe who originally shipped the bureau cabinet from India to London hence the written inscription on the top of the lower section “OUT OF NO. 201 HOUGHTON, CAPT MONRO”. Capt Monroe brought the East Indiaman Houghton back from India in 1788. Possibly acquired by Humphrey Hall (1738-1801) of the East India Company, by descent to William Marshall of Sarnesfield Court, Weobley, Herefordshire, sold at the Sarnesfield Court House sale in 1956, 1ot 181 where it was acquired by the last owner. 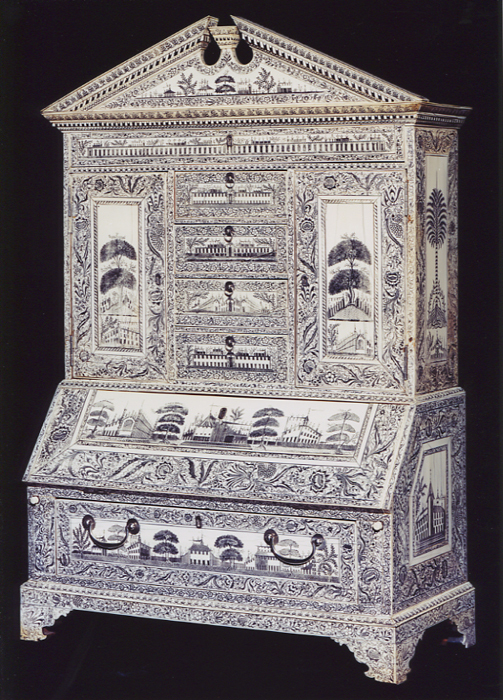 Amin Jaffer, Furniture from British India and Ceylon, 2001, for other very similar examples of this rare bureau cabinet. Maximum height 36 3/4in (93.5cm). Maximum width 24 1/4in (61.5cm).